We quit using this crap years ago this company needs to be put out of business. Use vingear & salt works great for all kinds of weeds……. 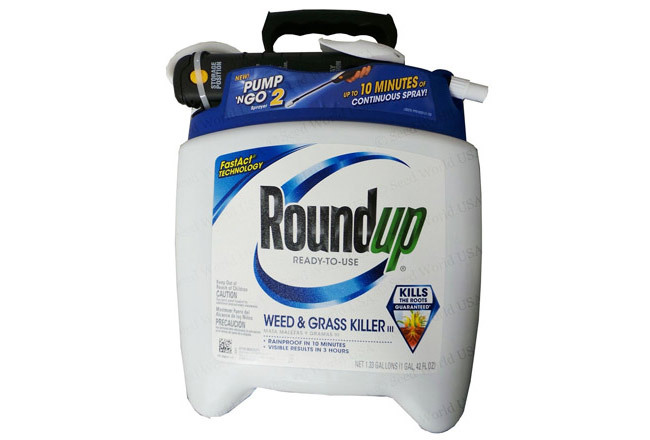 For years and years I’ve been cautioning my friends about Round-Up and have told various gardeners and lawn companies not to come anywhere near my house with that stuff. I don’t want my pets walking on it or any residue going into the water supply from runoff, either. It’s banned in so many countries, but not here. Oh no, Wall Street wouldn’t like that. Monsanto is one of the darlings of American consumer products. If you value your health, and the health of your family and pets, DON’T USE ROUND-UP WITHOUT KNOWING THE RISKS AND READING THE WARNINGS. Let’s not forget that all those lovely chemicals get washed into the swales, ditches and canals. The saddest part is the MOST of the farmland in the USA has been treated with this stuff AND it has made it’s way into the food chain. Shows up in Wheat, Corn, Soy……..on and on…….and it will remain in the soil for some time. Longitudinal studies should be done before assertions of safety. Before. Better find a cure for ALL cancers now ! If the weed killer is in the air, dust, food, water….We are SOL ! Just play some nice cowboy music during the commercials and show cartoonish flowers and nasty weeds and consumers will buy it up and srpay it like it is just water. To kill weeds, use a mix of Dawn dish soap, Epsom salts and vinegar. Here is the recipe. The Dawn dish soap remedy pops up constantly as a miracle weed cure on Facebook pages devoted to gardening. There’s some logic behind the concoction. The dish soap helps the mix stick and spread on leaves. Salt can be toxic to plants. And vinegar has been used to fight weeds, though usually horticultural vinegar, which has about four times the acetic acid of the vinegar we use in the kitchen. At 20 percent acetic acid, horticultural vinegar is dangerous enough that users are supposed to wear long sleeves, gloves and goggles to protect themselves from burns and splashes. The dish soap mix is a contact herbicide that works by drying out the leaves of the plant. Like Roundup, the mix doesn’t distinguish between good plants and bad plants, so if you decide to use it, watch where you spray it. Large scale Roundup use on crops is the biggest threat to all of us. My understanding is that the Monsanto seeds can’t be banked season to season. What a racket… Monsanto is an humongous evil entity. Watch “David vs. Monsanto” on Amazon Prime Video. It is rather IRONIC when Sea Ray was wanting to expand their operation to emit up to 500 tons a year (1,000,000 lbs.) of mostly the Hazardous Air Pollutant Styrene into the air we breathe, many in the development community including GoToby, Charlie Faulkner, Flagler County Board of Realtors, Chamber of Commerce, Helga Van Eckert from Economic Development, Flagler County Planning Director, The Board of County Commissioners, etc, their was no apprehension expressed on their part. Very few individuals were concerned about their Styrene emissions. Factual evidence was presented at that time from these same experts who also listed Styrene as a CARCINOGEN. Yet, most ignored this alarming fact. Here is a link from the SAME EXPERTS that classified Glysophate as a CARCINOGEN in the above article. Facts matter, especially when it comes to cancer.